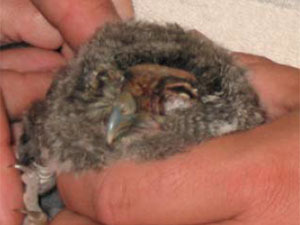 June 12, 2008, juvenile male screech owl found hyperthermic, nearly drowned in a pond. Scalp lacerated, maggot infested, left eye closed and maggot infested, right hock edematous. June 13 exam by DVM found lacerations on scalp believed due to predator attack. Scalp from eyes to caudal portion of skull removed due to injury and infestation. Viability of site was questionable. Left globe intact, no blood, infestation cleaned and treated for conjunctivitis. Oral Baytril, topical Ciprofloxin, and Flurbiprofen given; diluted Chlorahexidine applied to wound. Photo taken June 16, 2008, three days post surgery. Due to concern that tissue would become necrotic, low level laser therapy was initiated. Dosage of 1 J/cm2 was delivered (F1) with 2400XL laser, 500mW probe, total treatment six to eight joules, once daily. Treatments 6/13, 6/14, 6/20, 6/21/2008 (four treatments). June 20, 2008 DVM rechecked patient, tissue on dorsum dry and healthy, no necrosis, left eye resolved. Consensus among Doctors regarding total wound closure and feather follicle regrowth was mixed. Additional low level laser treatments were ordered to close the wound and stimulate follicle re-growth. Over next two months, additional therapy administered on four occasions, 7/5 and 7/6/2008 and 9/11 and 9/12/2008 using above protocol. 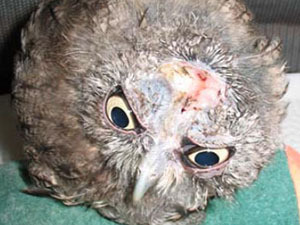 In September, the owl’s minor moult revealed pinfeathers in lacerated area and on eyelids. Due to re-growth of feathers, decision to overwinter the patient and allow full moult in 2009 to increase survival potential. The Respond Laser worked very well to expedite healing of the scalp laceration, but also appeared to stimulate feather re-growth in area with severe damage to follicles. 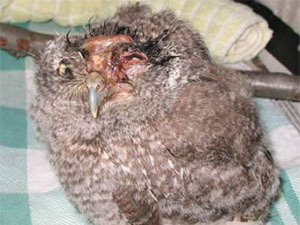 The owl did not become stressed because of the speed of the laser treatments.